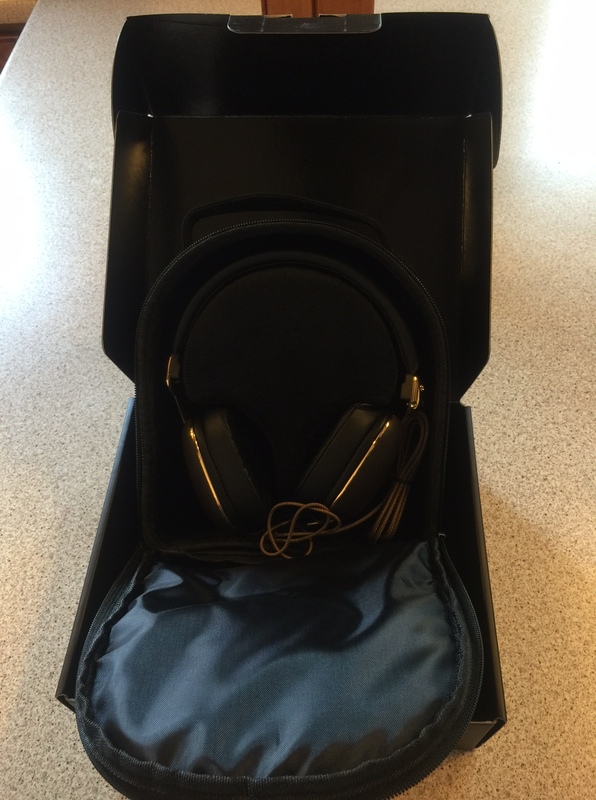 Inside the outer box is a ‘D’ shaped carry case in black nylon with carry handle and double zip that when opened up reveals the headphones sitting in a velvet-like interior that is shaped to hold the headphones snug. Betron was off to a good start, especially as I only ever got a thin drawstring nylon bag with my SkullCandy Hesh headphones that I will be comparing these to! At first sight the headphones look gorgeous and have a classy retro look to them in a rich brown wood and gold effect styling. Getting to grips with the headphones themselves and the feel of the headphones is one that reveals some highs and lows. On the plus side the 3.5mm gold plug is one where the cable exists from the side of the plug at 45 degrees, with a high quality feel braided cable and gold splitter, offering tangle free cabling. The L/R indicators for each side are discreetly labelled inside the headphones above each earpiece, with a subtle branding on the outside. On the downside is the feeling of materials cheaper than they appear, especially around the area of the headband joining to the earpieces – but let me be clear that this does not mean they are not well build. Betron claim that there are no visible screws which there are none, however there are visible rivets. As stated earlier Betron claim that the headphones are comfortable, cool and a clarity of sound with a deep rich bass. Upon the first point I can wholeheartedly agree, my current headphones of choice have been Skullcandy Hesh over-the-ear headphones and I have found them heavy and too hot after a prolonged use of anything over thirty minutes and I don’t like the feel of on the ear headphones such as the Skullcandy Lowriders as they are uncomfortable and unlike the Hesh model let in too much surrounding noise ( plus they slip off if you are doing anything beyond sitting still). The HD1000’s are a joy to wear, comfortable, lightweight, they don’t get hot ( and that has been in the recent 30 degree weather) and they reduce ambient noise far more than other on-the-ear headphones. So onto the all important bit, the audio, and do these headphones live up to the manufacturers claims? Well I listen to a diverse range of audio – including podcasts, audiobooks, radio plays, music and a variety of video and films. I even listen to text to speech conversions when I need to listen to reports and I am travelling between locations (these are not the easiest to listen to) and always willing to allow for others opinions I even asked my wife to try them out, as a fitness professional and having to listen to a wide range of music that requires choreography I though her opinion would be valid ( The wife’s choice of headphone is the Skullcandy Lowriders that I am not a fan of – even less now I have used the HD1000’s). Overall I can report that the quality of the audio is superb with a rich definition to the audio that is not affected by the increased bass. The wife definitely stated that the audio was excellent and that the headphones were extremely comfortable in comparison to the Lowriders and I feel that the audio is actually compatible to the Hesh headphones.At the RRP the quality up close lets the headphones down but if you are looking for well priced, comfortable and good quality audio these are great headphones. At £29 they are an absolute steal! Betron has provided me with this product for purposes of providing a personal review and I have received no payment for this unbiased review.